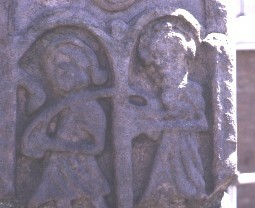 This is the top row of the Calvary scene. Christ is carrying the cross in the upper left panel. The figure in the bottom right of these four also carrying a cross is thought to be Simon of Cyrene. The other two figures are probably two soldiers, or they could be the two thieves.